Great idea. Create a sort of spooky, short opera program in a funky location and use it as a fundraiser for your next major project. That was Darknet at Mây last night. 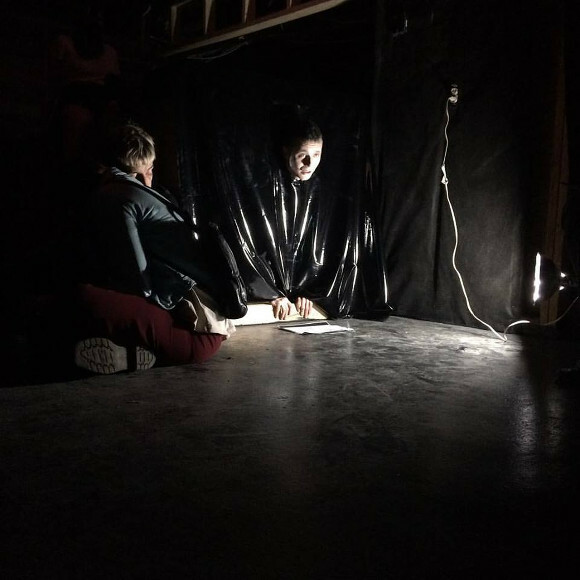 Jennifer Krabbe, singing Berlioz, rounded us up in the bar and ushered us downstairs into an installation created by Alessia Naccarato and Noah Grove. It was dark. It was eerie. We were offered masks. Cairan Ryan sang The Cold Song from Purcell’s King Arthur while writhing on the floor. Jonathan MacArthur sort of emerged from some sort of primeval goo singing Aria by John Cage and Beth Hagerman gave us one of Lulu’s arias. Then we were rounded up and ejected into the light again. Loved it. 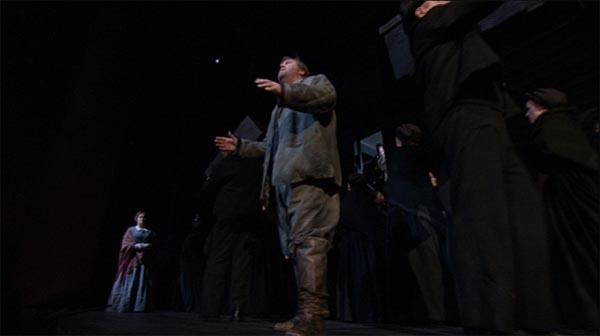 I liked the 2008 MetHD broadcast of Britten’s Peter Grimes enough to buy the DVD as soon as it came out. After something of a hiatus I just watched it again. It’s an odd production. The director (Tony award winning – run for the hills) John Doyle, was the first to use, I think, what has now become a Met cliché; a wall with windows running the whole width and height of the set. In this case it can be moved forward and back but mostly it’s forward compressing the depth of the stage. The idea is to convey the claustrophobic nature of the Borough which is fair enough but mostly what it does it confine the enormous chorus to a space it barely fits in meaning there are few options but to have it face straight forward in serried ranks and sing. To be fair, there are scenes where it’s very effective; the opening inquest scene for example and “Peter, we’ve come to take you home” in Act 3. It’s much less successful in, for example, the pub scene. The production is also very dark. This always bothers me because despite eating vast quantities of carrots my night vision isn’t great. I don’t really get it. Dark as a metaphor is pretty blatant and comes at a heavy cost in terms of the production’s ability to convey anything else. Only at the end, in the final chorus, is the wall removed and the stage lit less funereally. 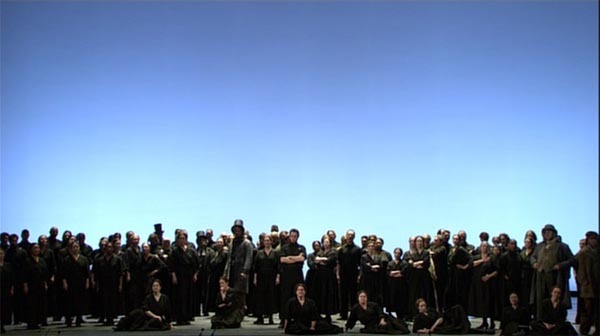 The sea interludes are played out in front of a blank wall. No effort is made to give them visual accompaniment. The “wall” and the naked Interludes both tend to banish the sea from the production. There’s really no sense that the Borough is a fishing village and therefore the whole role that the sea plays in the psyche of people who make their living from it is lost. The video director, Gary Halvorson, appears either to hate the production or think that the cinema/DVD audience is too thick to get it because he relentlessly undermines it. Unable to present the dark, stark stage that Doyle has called for he gives us a compilation of super closeups and really weird camera angles; pointing up from the side of the pit, pointing down from what looks like the cheapest seats at the outermost edge of Ring 4 and so on. He also can’t accept that the director doesn’t want to distract from the music during the Interludes so we get a succession of close ups on audio members and, more especially, on conductor Donald Runnicles. This is particularly unfortunate as Runnicles conducts like a hyperactive and self regarding pterodactyl. The above got over with there’s much to like in this DVD set. The performances are generally very good. 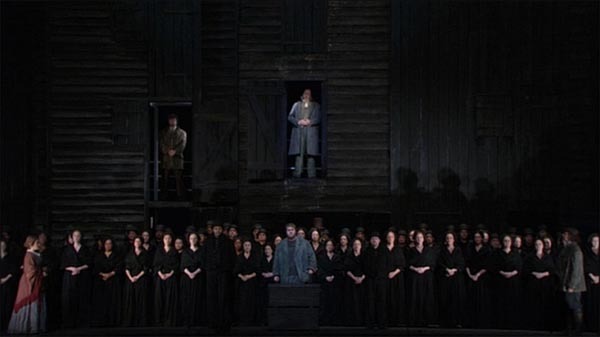 Tony Dean Griffey is a highly effective Peter Grimes as well as singing very well. He’s close to Peter Pears in his almost dreamy interpretation. He lacks the intensity of Langridge or the brutality of Vickers but its a valid and compelling portrayal. Anthony Michaels-Moore almost steals the show as Balstrode. This is surely the best take on the role since Geraint Evans. The sense that he’s the one man who really wants to help Grimes but knows when enough is enough is overwhelming. There are good performances in the other male roles especially from Teddy Tahu Rhodes as Ned Keene. The women are more of a mixed bag. I still can’t really get into Patricia Racette’s Ellen Orford. She acts well and is sometimes very lyrical but at other times she seems shrill and her vibrato too much for my taste. The Auntie of Jill Groves though is really good. Even toned and with a suitably cynical but not unkind persona she nails the role. The Mrs. Sedley of the timeless(1) Felicity Palmer is also quite excellent. She’s acid without being unmusical and not at all caricature like. Donald Runnicles takes things at a generally rather leisurely pace which makes the first act in particular drag a bit but the tension does build and there’s no disputing the beauty of the orchestral playing. The chorus is excellent throughout. Technically it’s a typical DVD transfer of a MetHD broadcast. The picture quality is very good and the DTS 5.1 sound is excellent (LPCM also available). There are subtitles in English, French, German, Italian and Spanish. There’s a track listing, synopsis and unhelpful essay printed in English (French and German versions in PDF on the disk). The interval features are typical but livened up a bit by Natalie Dessay who seems more willing to go off script than the other Met regulars (probably why she no longer seems to appear). Bottom line, it’s good but I’m still searching for the ultimate DVD Grimes.